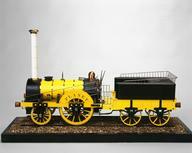 Model locomotive, tank engine, wooden, G1 scale, Great Central Railway 4-6-2T No 165, in wooden case. Wooden case missing. Overall: 140 mm x 410 mm x 92 mm.